Yesterday was my LONG awaited appointment at Johns Hopkins Bayview Headache Center, a division of their Neurology Department. If you've been a reader of my blog for a while, you know I've been waiting for this appointment since this summer, but the soonest they could see me was, well, yesterday. I got up at 6am so I could get to Baltimore, MD by 8:30. And I do not DO 6am happily, leaping out of bed with sunshine and roses in my heart. More like a poked-with-a-stick bear with eyes still shut and one heck of a grumpy streak. My dear husband did a quick Starbucks run, filled up my van, and had me ready to go before I was out of the shower. What would I do without him? Probably sleep late, (mmmmmsnoreszxx) but no really, he's awesome! It had snowed the day before, but the roads were clear. I plugged the address into the GPS, threw a CD in the player, and off I went, hopeful and glad the six month wait was over. Now, I love having a GPS. And I am familiar with a lot of local cities -- Washington DC doesn't really phase me much, and parts of Baltimore are no longer difficult. 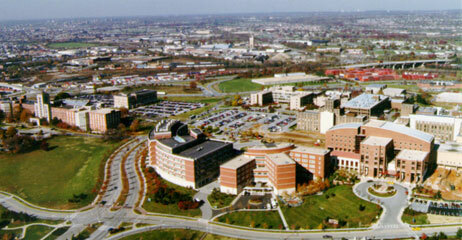 But Johns Hopkins is in a corner of Baltimore I just don't know. No worries. Remember, I have a GPS. 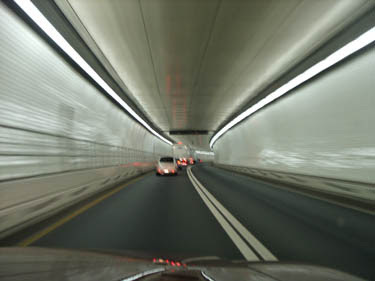 Here comes the Fort McHenry Tunnel, so I know I'm almost there. 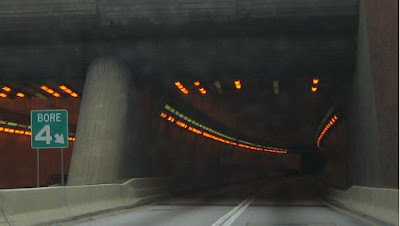 Factoid -- I'm claustrophobic and particularly hate tunnels. Probably due to having to sit for two hours inside the Chesapeake Bay Bridge Tunnel as a young child on the way to the beach, smelling nauseating gas fumes, and listening to my dad THINK he was being HI-larious say, "OH, kids, see the water dripping down the walls? Think she'll hold?" Thankfully, we didn't go on vacation much. I've been to the Bayview Campus exactly once but remembered a tricky turn. Feeling smug, I looked at the GPS and made the turn. Not only was I heading BACK down the highway in rush hour traffic, but I had to listen to that annoying, self-satisfied GPS woman say, "Recalculating" like I was the dumbest person to sit in a car. I'd missed the CORRECT turn by about, oh, 40 feet. So now I have to drive to the next exit, make a U-turn, and hit the correct exit this time. Easy. The Harbor. With a TUNNEL. After three trips and $6 in tolls, I finally made it to the right road, only to miss another neighborhood road -- but at this point, I could see the hospital on the hill and turned the GPS off just as Mrs. Getting-on-my-Nerves was saying "Recalculating". Until I remembered I had to go BACK through the tunnel on the way home. Driving home was directionally just fine. 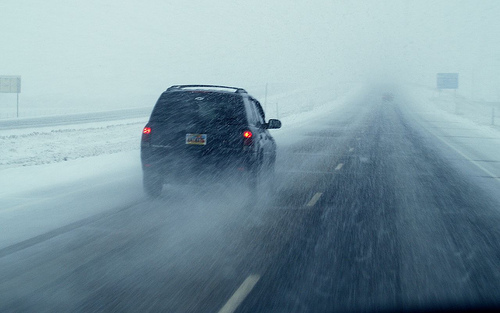 But I must have peeved off Miss GPS because she knows Mr Burly Weather Man because he made it snow the entire way home. She holds a grudge like that. I don't know what it is about me and directions. On both of my trips to NYC with my husband, we traversed the city entirely by subway. We'd get off at some underground station and he'd just say, "This way", knowing which way to go, without looking at a sign. Me, I'm the sort that would say, "Turn left at the gas station, then you know that cute pink house? Turn left there." But Miss GPS would snort at that. If she had time, that is, between saying, "ReCALculating", and "Turn left -- (sigh) reCALculating". "But now at least I'll know how to get to the Bayview Campus", I thought. The rest of the appointments are at Johns Hopkins main campus, all the way on the other side of Baltimore. Oh well. At least I don't think I have to go through the tunnels four times in one day! Oh, Lori, I hope they can figure out your headaches. I suffer migraines (only occassionally though so it's not a big deal), so I can sympathize. I am so directionally challenged... and have a husband who in a foreign country, without a map, can say "I bet if we turn here, we'll end up ______"... and he's always right... and I'm always wrong... I just blindly follow my GPS and hope for the best. I had 2 job interviews this week, and he had to drive me to the locations the night before so I was sure my GPS wasn't wrong and I knew what it looked like. Good luck with the tests and with finding your way around Baltimore! I bet you had a wopping headache by the time you got there making you a believable candigate for their care. I am directionally dyslexic so I completely understand. Driving to California last weekend the battery in the Garmin that my buddy brought decided to go dead right when we needed it the most. Thank God we are old fashioned and actually brought a paper (PO the tree huggers) map with us. We found our way to Oceanside and then all the way to Ontario with the map. Hope you get your headaches taken care of. HATE tunnels! And also hate MRI's, which aren't too different from being in a tunnel. Hope you get some answers soon, in regards to your headaches. Oh sweetie! I am glad that you made it there and back safely, even if it was the "scenic" route again and again. Hope they will be able to bring you some relief. Hope they can get ya help for the migrains. No one should be in that much pain. I am so glad you made it and can help with your headaches. I hate tunnels, too, and talking electronics. I would have had a major headache by the time I arrived. BTW, a friend of mind had major back surgery at JH and she says it's the best medical treatment she's ever received...and she doesn't hand out compliments very often! Lori, I am so glad you finally got in for this appointment. I know how long you've waited. Hope it gives you some good answers. I'm not hot on tunnels either. I don't mind be a passenger as much as being a driver. Those other cars just seem way too close. I am so your people, and my hubby is so your hubby's people. YOu know that navagational thing they had a while ago, Tom Tom? I call my hubby Chris Chris when we are traveling because he just knows the right way instinctually. I, on the other hand, once got lost coming home from the target i shop at all the time that is 2 miles from my house. Hey! It was dark! Arg! Sounds like a curse-worthy trip. There's nothing intuitive about Baltimore! Glad you made it there and back safely. I hope the appointment went well and treatment/recovery will soon follow. Have a good weekend. Fingers crossed they are able to help you with your migraines! 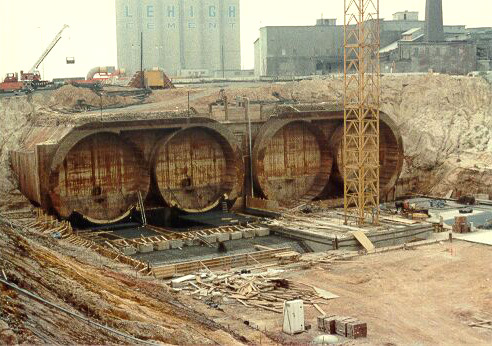 Lori, we lived in the Norfolk area for several years so I can relate to all of the tunnels. I too am not crazy about them.....especially waiting in traffic in them! I will be very interested to hear what you found out. My husband has suffered with migraines since he was a child. He's tried many treatments but no cure yet. Glad you got home safely!! I feel the same way about the GPS ladyvoice. She sounds so disappointed in you when you don't follow her directions! Much like the nuns who taught me in school. Once I tried to use her when I was driving from Los Angeles to Portland. She kept insisting I use the 101 (ocean view) freeway, when the 5 (inland, but 5 times faster) was what I preferred. Had to turn her off. Hey Lori, I sure hope it was all worth it ... you were very brave to go it alone, and thru a tunnel! I like them not! I wish all the best for you, take good care. Lori, I hope they find the source of the headaches and can rid you of them. Keep us posted on your progress. Ah, I totally feel for you. This one reminds me of that trip home from Bead Fest when Jeanette and I were not paying attention, ending up nearly in NY! Remember that call??! :-) You made a fantastic human GPS. Oh, I hate driving in big cities. Hopefully they can help you with the headaches. 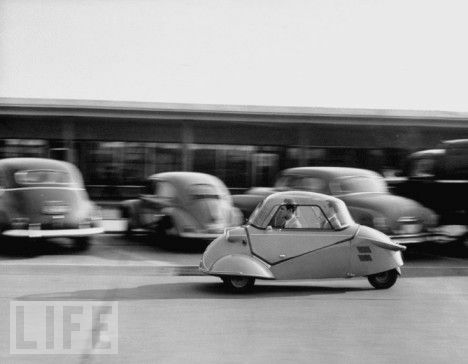 BTW, my Dad had a Messerschmitt "Kabinenroller" (that's what this model is called). Two wheels in front and one in the rear. Funny car! And not for families as it has only two seats, one behind the other. I hope your appointment was productive and that you'll soon have some relief from your headaches. I share your frustration with the GPS. Sometimes I go the wrong way just to annoy the Garmin lady! Still always bring along a map -- like to see the bigger picture! We named our GPS "Betty" I do well with her, however, I am with you. Tell me to turn at the pretty pink house and I will get there. You and your adventures!! lol So glad you finally got your appointment! My DH will come back as a homing pigeon or a bee, he always seems to know his way around, it never rubs off on me though. He has an unerring sense of direction. I'm so bad at finding places I don't know, he tends to take a day off and take me himself if I have to go somewhere I haven't been before. Hope JH gets to the bottom of your migraines and there's help to be had for them. I am really hoping that after all of this the medical staff was kind, caring and has some idea of ways to help you. I have been dealing with cardiac issues and lack of energy. I know that if I lost weight I would feel better. What they don't want to hear is that I follow their directions and am not improving, as if THAT is my choice. 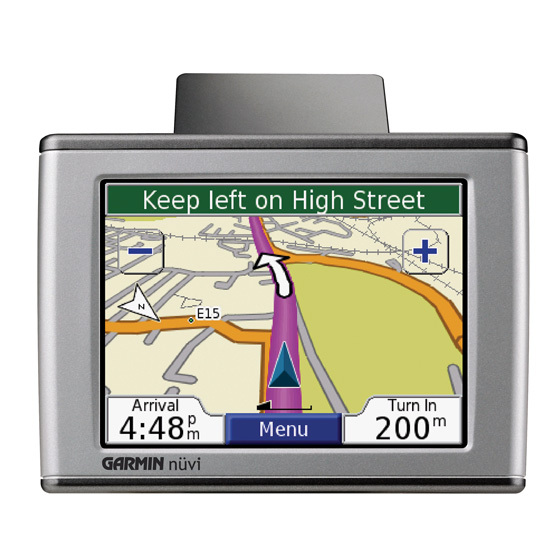 Do you get to choice a voice on your GPS? Lori, so glad you made it there and back safely. I hope the appointment went well and you're on your way to relief from your migraines! GPS is sometimes more of a pain in the chotsky than anything else! Good luck!!! and blessings of healing!! !